In the last months the planets Mars and Saturn have each been in opposition to Earth — Saturn on 27 June and Mars on 27 July. An opposition occurs when the Sun, Earth and an outer planet are lined up, with Earth sitting in between the Sun and the outer planet. During an opposition, a planet is fully lit by the Sun as seen from Earth, and it also marks the time when the planet is closest to Earth, allowing astronomers to see features on the planet’s surface in greater detail . A month before Saturn’s opposition — on 6 June — Hubble was used to observe the ringed planet . At this time Saturn was approximately 1.4 billion kilometres from Earth. The taken images show Saturn’s magnificent ring system near its maximum tilt toward Earth, allowing a spectacular view of the rings and the gaps between them. Though all of the gas giants boast rings, Saturn’s are the largest and most spectacular, stretching out to eight times the radius of the planet. The dates of opposition and closest approach differ slightly. This difference is caused by the elliptical orbit of the planets and the fact that the orbits are not in exactly the same plane. 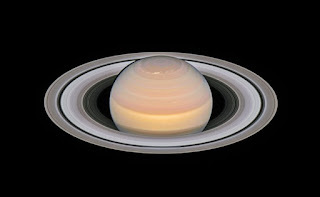 The observations of Saturn were made as part of the Outer Planet Atmospheres Legacy (OPAL) project. OPAL is helping astronomers understand the atmospheric dynamics and evolution of the gas giant planets in our Solar System. Jupiter, Uranus and Neptune have already been observed several times as part of this project, but this is the first time Saturn was observed as part of OPAL. Data from NASA’s Cassini mission suggest that the rings formed about 200 million years ago, roughly around the time of the dinosaurs during the Jurassic period. The gravitational disintegration of one of Saturn’s small moons created myriad icy debris particles and collisions lasting until today; it is likely that they continually replenish the rings. The planet’s banded structure, clearly visible in the new image, is caused by the winds and the clouds at different altitudes. The moons seen here are all icy and cratered. Enceladus is considered a candidate for the existence of primitive life because it is outgassing water vapour from a subsurface ocean. Based on data from the Cassini mission to Saturn, scientists hypothesise that a small, wayward moon like one of these disintegrated 200 million years ago to form Saturn’s ring system. 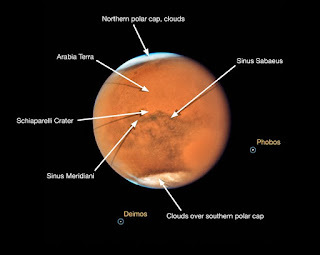 This annotated image of Mars shows features of the planet that were visible in summer 2018 despite a global dust storm. During the time of observation it was spring in Mars’ southern hemisphere, where a dust storm erupted and ballooned into a global event that is blanketing the entire planet. Even so, several distinctive features can be identified. The large oval area at the lower right is the bright Hellas Basin. About 2200 kilometres across and nearly eight kilometres deep, it was formed about four billion years ago by an asteroid impact. Many global dust storms originate in this region. 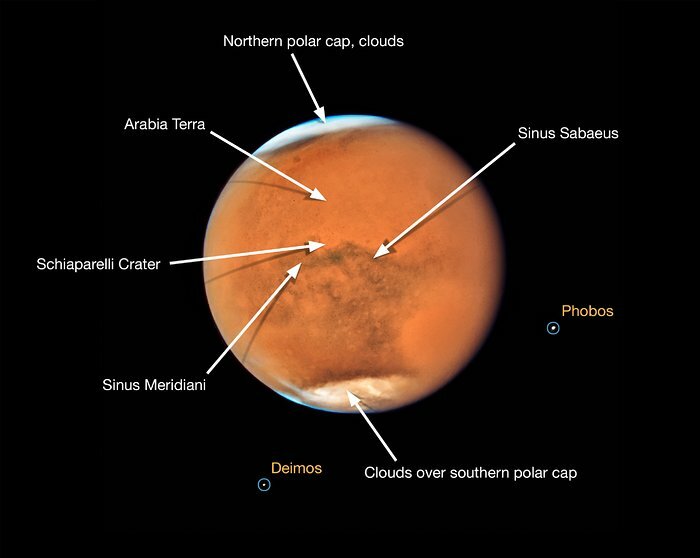 The orange area in the upper centre of the image is Arabia Terra, a vast upland region in northern Mars. The landscape is densely cratered and heavily eroded, indicating that it could be among the oldest terrains on the planet. South of Arabia Terra, running east to west along the equator, are the long dark features known as Sinus Sabaeus and Sinus Meridiani. 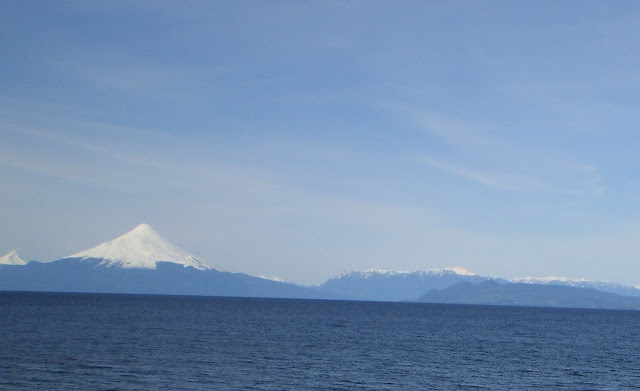 These regions are covered by dark bedrock and fine-grained sand deposits ground down from ancient lava flows and other volcanic features. These sand grains are coarser and less reflective than the fine dust that gives the brighter regions of Mars their rusty appearance. The two small moons of Mars, Phobos and Deimos, appear in the lower half of the image. 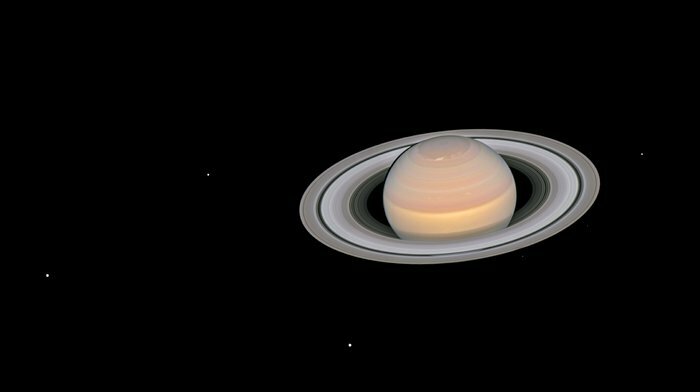 This video shows the Hubble observations of Saturn in June 2018. Hubble observed the ringed planet several times over the course of 20 hours, which allowed it to see some changes in the wind patterns in Saturn’s atmosphere. These changing patterns are most visible in the region surrounding the northern pole. The animation shows the rotation of Saturn as seen by Hubble, thanks to an observation spread over 20 hours. It also shows some of the brighter moons which were visible throughout the observation. 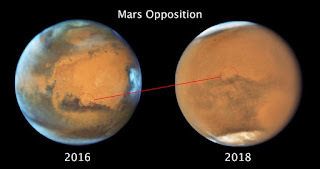 This animation shows the rotation of Mars over the course of 42 minutes and is based on observations made with the NASA/ESA Hubble Space Telescope. While a host of Mars’s characteristic surface features are hidden by a planet-wide sandstorm, both the northern and southern polar ice caps are clearly visible. 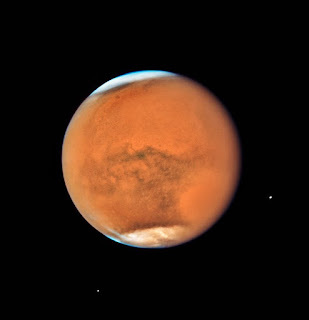 The animation also shows the two tiny moons of Mars, Phobos and Deimos, orbiting the red planet. This video shows the difference in orientation of Mars between the 2016 and 2018 observations, and it also illustrates the obscuration by the dust storm enshrouding the planet in 2018. The opening image, taken by the NASA/ESA Hubble Space Telescope on 12 May 2016, shows a clear atmosphere with summer in the northern hemisphere. Three-dimensional models created from NASA’s Viking mission illustrate how the northern hemisphere was tilted away from Earth in 2018. The final image, taken by Hubble on 18 July 2018, shows a global dust storm, with spring in the southern hemisphere.